The Grand River Watershed, located in northeastern Ohio, drains 712 acres along its 102.7-mile course to Lake Erie. 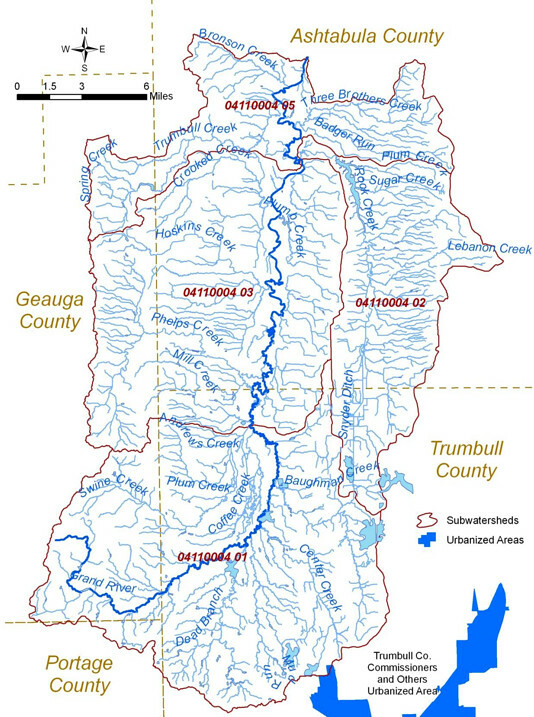 Due to the unique glacier formations found in Ohio 20,000 years ago, the headwaters of the watershed are located in Geauga and Portage County and they flow north through Trumbull and Ashtabula County. Then, when these waters reach the northern parts of Ashtabula County, the river heads west into Lake County before reaching Lake Erie at Fairport Harbor. The rugged landscape of this part of Ohio has allowed the Grand River to largely escape the most harmful effects of urbanization. As a result, the Grand River Watershed is one of the most biologically diverse areas in the Lake Erie-Lake St. Clair basin. The United States Congress has designated the Grand River as both a “wild” and “scenic” river. This distinction, while not only valuable for the protection of the wildlife relying on the river, also divides the watershed into two portions – the Upper Grand River Watershed and the Lower Grand River Watershed. The Upper Grand River Watershed contains the portion of the river that is designated scenic, bordered by vast swamp forests. River otters and beavers are known to flourish in this portion of the watershed, as well as a number of other wildlife species. White-tailed deer, wild turkeys, upland wildlife, and waterfowl are the principal game species. Cottontail rabbits, fox squirrels, ring-necked pheasants, and raccoons are especially plentiful, while woodcock and snipe frequent the area. Panfish, bass, and chain pickerel are the major species of pond fish and walleyes and suckers are common in the river. Photo via Kaibab National Forest (Flickr). The Lower Grand River Watershed contains the portion of the river that is designated wild, bordered by long stretches of undeveloped hemlock ravines. Bird and plant species are known to flourish in this area of the watershed, including but not limited to: black-throated green warbler, Canada warbler, Canada buffalo-berry, cow-wheat, dark-eyed junco, hermit thrush, flattened wild oat grass, magnolia warbler, riffle snaketail, solitary vireo, round-leaved dogwood, sweet-Indian plantain, mussel beds, Uhler’s sundragon, winter wren, and the beech-sugar maple forest. Unfortunately, non-native species are becoming more and more common in the Grand River Watershed, threatening the survival and health of the species native to the area. In the Grand River Watershed, natural predators and the existing food supply have controlled the native animal and plant populations. However, when non-native species are introduced, the natural balance of the ecosystem is disturbed. Most non-native species do not actively disturb the environment they are introduced to. However, some non-native species continue to grow unchecked without predators and natural competitors, so they push out the native species and cause an environmental imbalance. These are called “invasive species.” The introduction of invasive species is occurring in all habitats around the world at an alarming rate, due mostly to transport, trade, and agriculture. Reed canary grass; photo by stillriverside (Flickr). The most pervasive invasive species found in the Grand River Watershed are the common reed canary grass and buckthorn, which expand rapidly through wetlands. These plants have been crowding out native plants, eliminating certain habitats, and changing the direction and flow of water over the land and into Lake Erie. More specifically in the Lower Grand River Watershed, the invasion of giant reed grass, phragmites, purple loosestrife, garlic mustard, and Japanese knotweed have had many negative impacts on the marshes located in this region, including crowding out native species. These invasive plant species have the potential to create devastating results for animal populations that rely on the native plant species for survival, causing some in the area to migrate to other areas, further perpetuating the invasive species problem. Aquatic invasive species have also become a significant problem in the Grand River Watershed. In the past decade, the zebra mussel and round goby have been destroying and disrupting aquatic communities surrounding the great lakes. Presumably transported in ballast water discharged by transoceanic vessels, these invasive species have contributed to significant habitat destruction, overfishing, pollution, and the loss of native species in the Grand River Watershed. While eliminating a species after it has been established is usually impossible, multiple efforts are currently underway to curb the growth of invasive species in the Grand River Watershed. For example, the Nature Conservancy is aggressively controlling the invasion of reed canary grass and buckthorn in the wetlands with the use of helicopters and amphibious vehicles to spray herbicides and conduct controlled burns to limit invasive species’ growth and give native plant species the chance to repopulate. The Conservancy is positive that if the areas are treated and the invasive species removed, the seed banks of the watershed should allow the native plants to come back. Limiting the growth of aquatic invasive species is a much harder task, but limiting ballast water exchange in the Great Lakes is the number one method of reducing the additional introduction of invasive species in the Grand River Watershed. Furthermore, fisherman and anglers can avoid the accidental spreading of invasive species by dumping their bait buckets only in the areas in which they were filled and by not taking animals home to add to their personal aquariums. While the problem of invasive species in the Grand River Watershed might seem like an uphill battle, the help of organizations like the Nature Conservancy, with the combined education of those living in the area, native species will thrive again. Hopefully more research determining the source of invasive species in the Grand River Watershed will bring us one step closer to protecting this unique, beautiful, and scenic watershed.